It was a trip that everything changed. While vacationing in Jamaica in July 2014, an accident on a water slide caused a fracture in Suria’s C6 and C7 vertebrae. She was helicoptered back to Philadelphia for surgery and arrived at Magee a few weeks later, paralyzed from the chest down. Being a bride was never tops on the bucket list for Suria Nordin. With a successful career as an international accountant and a loving, committed relationship with her boyfriend of 13 years, Kirby, Suria was glad to spend her time and money on memorable vacations with her beloved, rather than a big, fancy wedding. “Marriage was always on the horizon, but it wasn’t something we felt we had to do immediately,” Suria, 41, says. “We knew it was eventually going to happen, but there was no rush.” It was on one of their many trips that everything changed. While vacationing in Jamaica in July 2014, an accident on a water slide caused a fracture in Suria’s C6 and C7 vertebrae. She was helicoptered back to Philadelphia for surgery and arrived at Magee a few weeks later, paralyzed from the chest down. With Suria’s new needs, she and Kirby now knew they wanted to get married soon, so he could be formally involved in her care. During one of their rooftop chats, they thought, “Why not just have the wedding here?” What began as a quick ceremony for six or seven people quickly ballooned into an all-out affair for 70, once Magee’s Guest Relations team got wind of Suria and Kirby’s wishes. 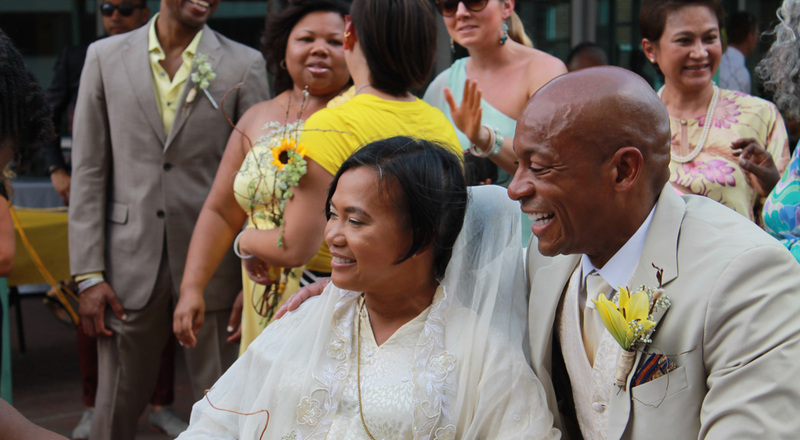 In just a week and a half, friends, family, and Magee staff divvied up responsibilities and came together to give Suria and Kirby their unforgettable wedding in the sun. Newlywed life has been sweet, with lots of milestones to celebrate. After Suria’s discharge, Kirby made renovations to his home in the Queen Village section of Philadelphia to accommodate his wife’s power wheelchair. With a background in technology, Kirby set up Suria’s iPad to allow her to control the home’s temperature, doors, televisions, and more. “I wanted to make sure I had some level of independence, and he gave that to me,” Suria says. In March, Suria returned to her job at Ernst & Young in Center City part time. “They were surprised when I said I wanted to come back,” Suria says, “but they’ve given me everything I need.” That includes two laptops, so she doesn’t have to carry one, an assistant to help her when needed, and the flexibility to work from home when the weather gets bad. This summer, Suria took her first flight since using her power wheelchair to a continuing education conference for work in Orlando. “I was anxious, but people were so incredibly helpful,” Suria says. “You see so many good people step up, wanting to help.” Before her injury, Suria was working toward a promotion, which she plans to pursue again. So how are Suria and Kirby celebrating their first year of marriage on September 6, 2015? “Fortunately, I have a husband who loves to cook. We typically don’t go out for dinner because his food is so much better!” she says with a laugh. “We’ll probably end up doing a cookout at the house, in the sun".